Source: “The importance of stupidity in scientific research”, Journal of Cell Science, 2008. What constitutes the typical publication? Source: “Are we training pit bulls to review our manuscripts?”, Journal of Biology, March 9, 2009. If you select a chart in SPSS, copy it, and then paste it into a Pages document, you’ll likely see a series of blank lines in place of the chart. This is due to SPSS copying the chart in multiple formats, one of which is “Plain Text”. Unfortunately, “Plain Text” is the format Pages elects to use when you paste the chart. 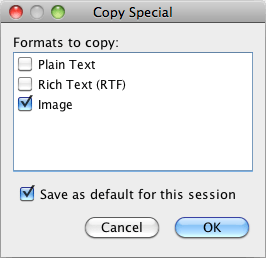 To get around this problem, choose “Copy Special…” from the Edit menu in SPSS. A dialog box will appear, in which you can uncheck “Plain Text” and “Rich Text (RTF)” and check “Images”. Now when you paste the chart into Pages, the chart graphic should appear. To retain this behavior for subsequent uses of the “Copy” command, check “Save as default for this session”.